Lagonda returned, briefly, to the manufacture of light cars in 1934 with the introduction of the Rapier, which was heralded by The Autocar as a thoroughly worthwhile newcomer among small sports-type cars. Tim Ashcrofts design had been on the drawing board for almost a year before it appeared in prototype form at the 1933 Olympia Motor Exhibition. In production from the late spring of 1934, the Rapier was reminiscent of a baby 2-Litre in appearance and was most often seen with four-seat tourer coachwork by Abbott. The cars most notable feature was its gem of an engine: a four-cylinder, twin-overhead-camshaft unit displacing 1,104cc and producing 45bhp on twin SUs. A sturdy chassis frame, ENV four-speed pre-selector transmission and 13 diameter Girling brakes completed the mechanical picture. For its engine size the Rapier was in a class of its own, revving comfortably to 5,500rpm, turning in impressive acceleration figures and a top speed of around 75mph. With such a specification the model was necessarily expensive to produce; sales were disappointing and in 1935 manufacturing rights passed to Rapier Cars Limited, of Hammersmith, where production continued for a few more years. Originally an Abbott-bodied drophead coupé registered BLT 391, this car, like so many, was re-bodied when its original coachwork finally disintegrated in the 1950s, a new two-seater body being fitted by Elliot Elder, of Edinburgh. The car was very successful in VSCC events in this form and was converted to 1,500cc engine capacity. Its single-seater body was fitted in 1956, and with this reduced frontal area the little Lagonda becoming a serious ERA chaser - fast but fragile - driven by Jon Abson. The current owners bought the car in 1984 from the Elder (deceased) estate and have steadily developed it into an ultra reliable contender. A supercharger was fitted in 2001, while other noteworthy features include a new 1,500cc cylinder block; new EN40B crankshaft designed by Honda Racing (their CEO was a Rapier owner/enthusiast! ); new con-rods; high lift camshafts; ENV 110 pre-selector racing gearbox; limited-slip differential; 16 wheels; and Alfin brake drums. Running on 100% methanol, the Rapier has won the prestigious Nuffield Trophy twice (in 2005 and 2006) setting remarkable lap times at Silverstone, Donington Park, Cadwell Park and also Prescott (below 45 seconds). It also won the Silver Conrod award in 2007 for the best presented car at VSCC events and has been outstandingly reliable, never failing to finish an event which it entered. 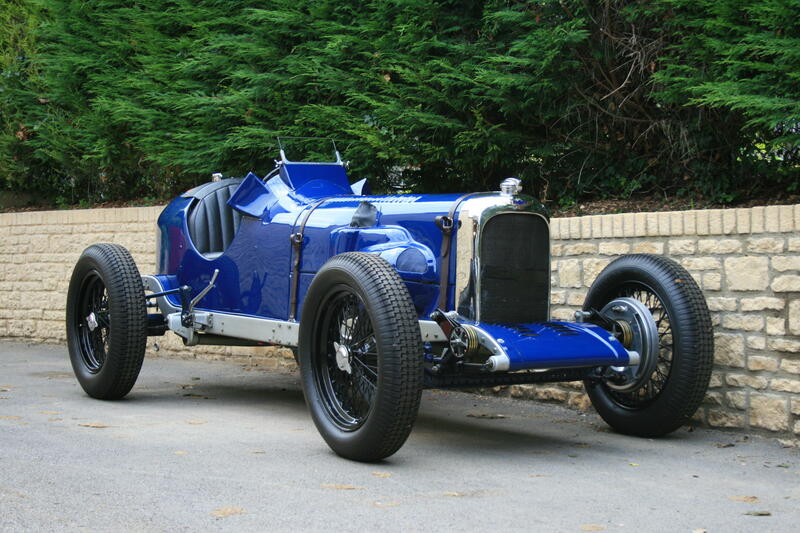 A seriously fast motor car at a fraction of the price of an ERA or Maserati, this unique Lagonda single-seater is regretfully offered for sale after 24 years of highly successful and enjoyable ownership and competition.